Anyways here are some specs. It's going to be a fun project, nothing crazy, just a fun weekend toy, and it'll deffinataley be going to the local shows.. Okay now that I've got the intro out of the way etc. etc. I can post some progress. I've put about 350 miles on her since I bought her cruising it a few times a week. I pulled the side bars off today, sanded them, primered them, than painted them. I'm going to finish them tomorrow and get them back on the car, so better pictures will come of how they turned out... but here's what I have of today. Lookin good! Amazing what a little sandpaper, water, and spray paint can do! Lol, I used brake cleaner! it seems to really work well... and dries quick... I use it one everything I paint.. but yes, I bought the nice "quality" spray paint.. They really look good. Look powder coated actually. Next is the Engine cage, and front bumper before I paint the car. So I think I'm going to be painting it Synnergy Green.. 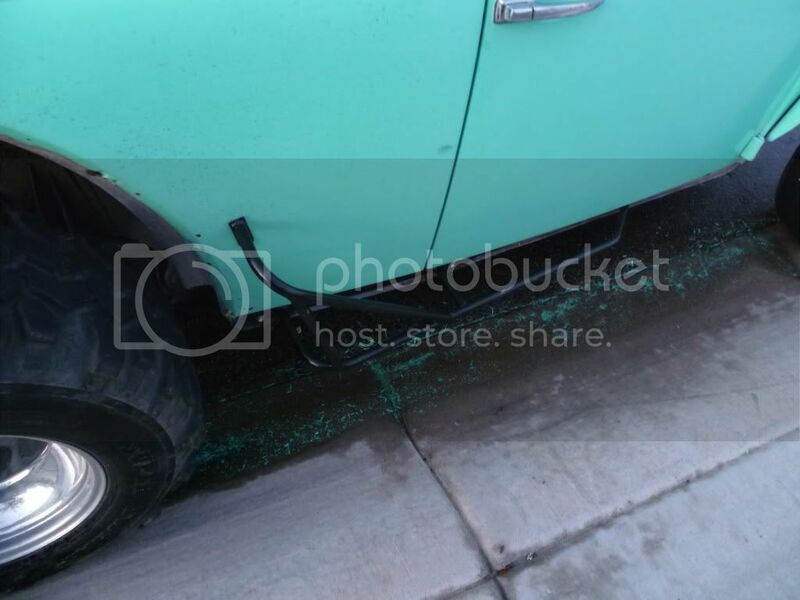 It's a bright cool looking green.. with some black side stripes like my last baja. The underside of the fenders will all be undercoated, along with the pan sides just to clean things up. I am ordering my interior friday, new carpet, and door panels. I'm going to strip everything out of this interior, and sound deaden inside the quarter panels, and door panels, and the rear well is going to be treated to the under carpet noise killer. Than I'll worry about the new interior. . When I weld in my Harness bar, the cage will get a fresh coat of paint. and it'll all be back together. I wanna spring for seats, but with the paint( $$$$$ ) , its going to have to wait. Especially because I'm prepariing to build a 1915..
Anyways guys, that's where I'm at for now. Like I said when I get the bars mounted up I'll have some good pics. Let me know what you think, I appreciate all opinions. Alrighty guys, got the side bars mounted and pictures taken. pretty soon they will be coming back off and put up in the garage while the car is getting prepped for some paint. 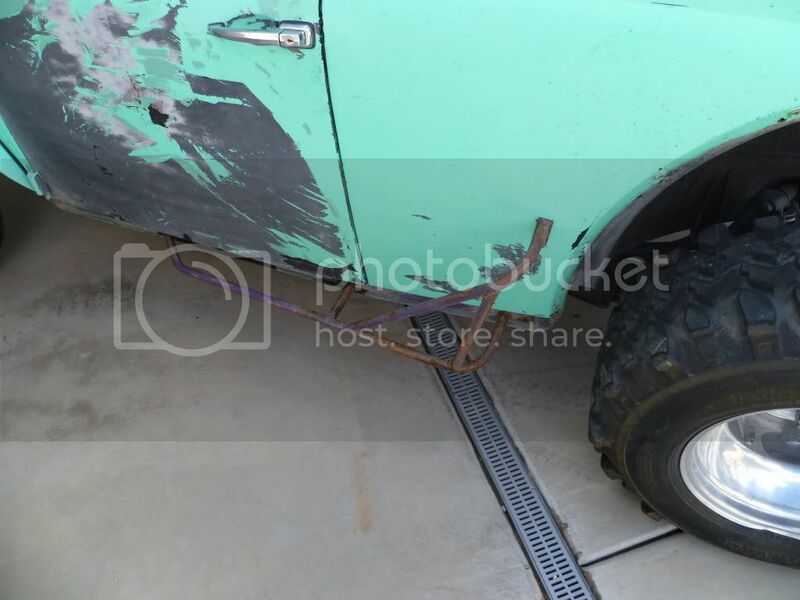 As I may have said earlier; Since I'm not doing a full body off baja-resto, I'm really hoping to get it completely "done" by BOR 2011.. See if I can maybe win myself a placque, or get a "hey nice ride man".. That would be a check on the ol' dreams list.. But to get there I have a lot to do and I've come up with a complete list of things I need to do. Friday is pay day (remember, I'm 17 and paying for everything on my own with Micky D's money ) and since this check doesn't get taken by insurance money, I'm going to be buying my carpet, and door panels. Along with some sound deadener. I'm also going to buy some tint for the windows. I like the way it makes the bug just look clean and mean. I know its not much progress yet. But I've been working 6 days a week the last few weeks.. Started prepping the pan for carpet ( It's kind of old and greasy and I just want a real good bond) so I'm spraying it with a cleaner, and scrubbing with scotch bright pads, than I'll go in and spray it all down with brake cleaner. Than lay down the deadener this weekend, and lay the carpet. 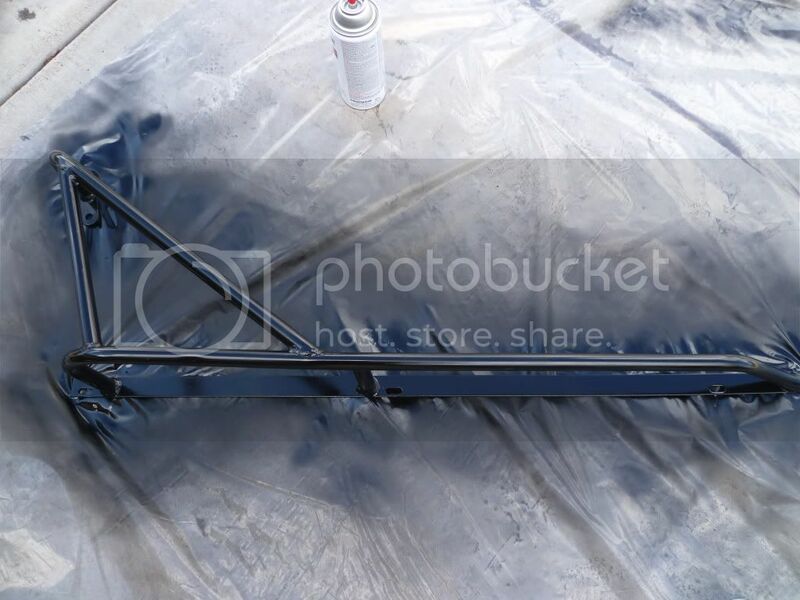 Ready to paint the engine cage, but I'm going to wait and do it with the engine tin, so Sunday after the ALL Mustang show it's going to be painting time. 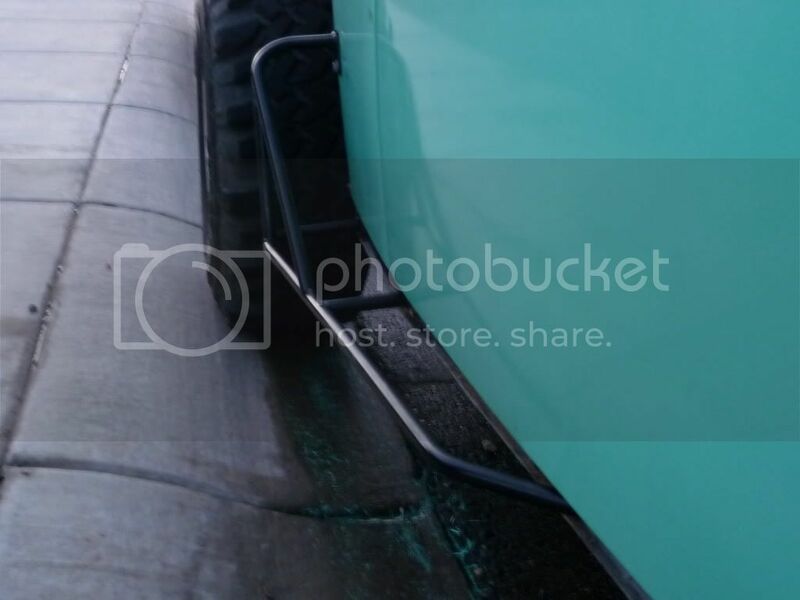 Than I'll worry about the front bumper, I think I have a piece of sheet metal to re do the front skid plate, So I'll just replace that and while it's off, mask off the nose, and paint the bumper, to get my "Teal and black theme going. As far as paint, I've decided I like the color that it is. So the exterior of the car will be getting paint matched, and the bumpers, tin, and side bars will all be black. The interior is already painted black, so it will stay black, and the glove box door, steering vents, and the cage will all be painted the same color as the outside. I think this will provide a nice contrast and look. Well guys, sorry for the novel, in the next couple weeks there will be more pictures and less words. YVW,,17 you say,,way cool,,You seem to have alot of drive,,Make it your own as they say,,nice work so far,,detail goes along way!! Lol, well I'm kinda stuck with detail in my head, its been pounded in there since I was little. I really can't wait to see some change on the interior, and hear some change from doing this interior.. It should really get me motivated to tackle some more paint stripping and get it ready for paint, however its getting cold, so that may have to wait until Jan or Feb. I dont wanna strip it and worry about surface rust while its waiting for the weather to warm up for paint. we'll see. This one's a 61, I just don't know how to change my sig from my red baja I had a while back.. Looking good keep up the good work!!! !